I had to go to a meeting last night, so my mom went through Bud's bedtime routine with him. This morning she asked me if I'd gotten the card he'd left on my bedside table before he went to bed. I rushed upstairs and found the card that I had given to my mother for Mother's Day. He had taken it, and over the place where I had signed my name he wrote his own. 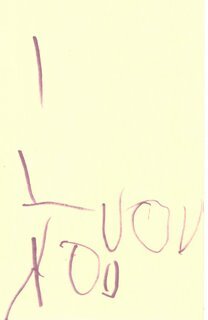 Then at the top of the page he wrote my name: "MOM." Don't you just luov it? I do just lyov it. Yes, I absolutely LUOV it!!!!! Bud is such a sweet guy!! !